← Student exchange opportunities! Grab it! This pretty challenging line, however without the question mark, is the title of a new manuscript, which we submitted yesterday. 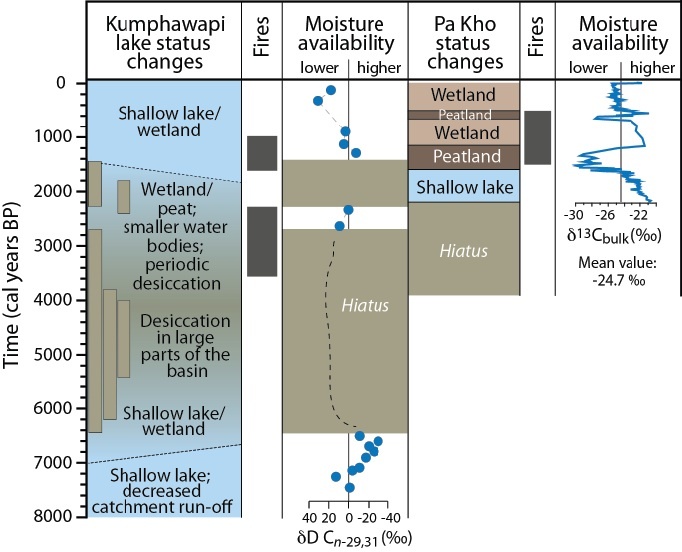 For this manuscript we pulled together all the paleoclimate evidences we have for Northeast Thailand based on our sedimentary records from Lakes Kumphawapi and Pha Kho, teamed up with the famous archaeologist Charles Higham from New Zealand, and came up with the hypothesis that Late Iron Age populations actually adapted to long-lasting weaker summer monsoon rains and did not just abandon their settlements. But let’s take it from the start! By analysing a multitude of different proxies in the sediments of Kumphawapi and in the peat of Pa Kho we are now able to reconstruct the climate story for northeastern Thailand. This reconstruction shows that the summer monsoon was considerably stronger some 7000-8000 years ago. Our idea is that much stronger monsoon rains led to an increase in biomass, which in turn caused the shallower parts of Lake Kumphawapi to gradually overgrow. Subsequently drier climate conditions led to the formation first of a wetland and then of a peatland, which experienced multiple wetter and drier climate intervals. These climatic conditions – between 6500 and 2600 years ago – coincided with the immigration of Neolithic farmers (c. 3700 years ago) and the subsequent Bronze Age settlements (c. 3000-2600 years ago). This means that both Neolithic and Bronze Age people very likely lived in NE Thailand when climatic conditions were considerably drier and summer monsoon rains less intense. With the start of the Iron Age (2600-2400 years ago) climatic conditions however changed and summer monsoon rains became stronger again, allowing Iron Age people to live a good live. These early Iron Age settlers decorated the graves of the deceased with surpluses of rice and nice exotic jewellery. Some 1600 years ago climatic conditions changed again, summer monsoon rains became weaker and also remained weak for the next 300-400 years. However and despite the obvious drought and aridity that swept over the country, later Iron Age populations increased, agriculture expanded, forests were cleared, iron and salt were mined on a large scale, and warfare increased. Mosts were constructed and also houses and a marked social stratification becomes visible in the mortuary goods. Instead of succumbing to drought, it seems that these late Iron Age populations adapted through distinct social changes to the change in climatic conditions. The settlements, which were constructed on mounds and surrounded by multiple moats (or channels), were later on merged into smaller city states. 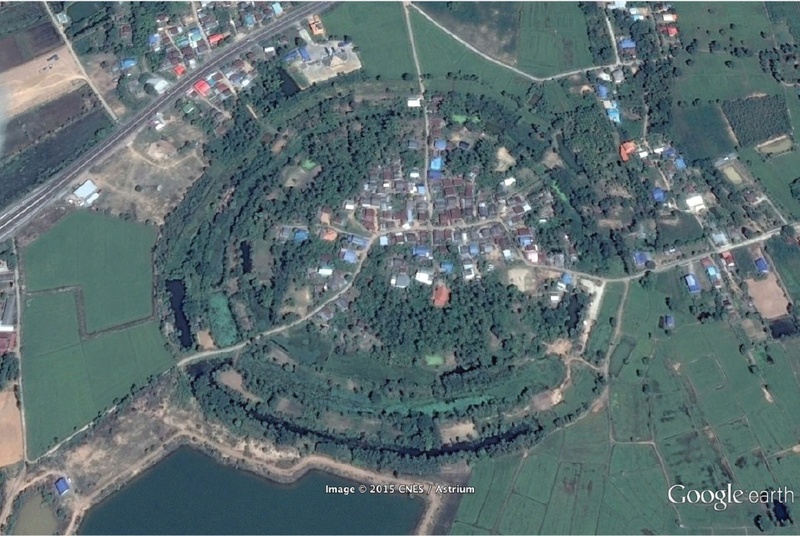 Even today many of these circular features can be seen in the landscape, and some still contain villages surrounded by moats to retain water to be used during the dry season. So – not abandonment, no overuse of available resources, and no going under? But – continuation, adaptation, and planning despite marked climatic changes? It will be interesting to read what our reviewers will say! In a seminar today at the Earth Observatory of Singapore I tested this new hypothesis of adaptation versus migration/abandonment, and I am guessing that I convinced most of the audience! This entry was posted in Asian monsoon, Singapore sabbatical, Thoughts and Tales and tagged Asian monsoon, Asian monsoon project, Department of Geological Sciences, Earth Observatory of Singapore, Geological Sciences, lake sediments, monsoon history, Nanyang Technical University, natural science, science, sediments, Stockholm University, Sweden. Bookmark the permalink.